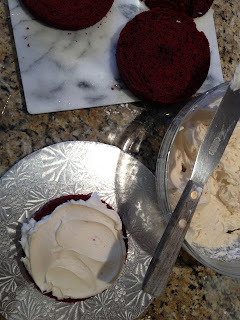 One of the first things I learned about my husband was that he loves Red Velvet Cake. I learned this in our first conversation (which lasted six hours) and what I also learned is that Red Velvet Cake is sacred. It. Is. Sacred. 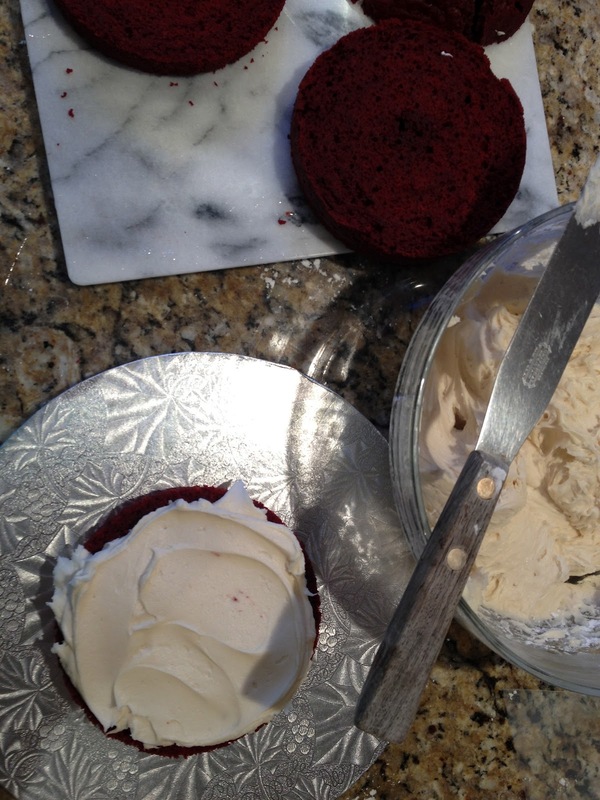 There is no other choice in cake BUT Red Velvet. 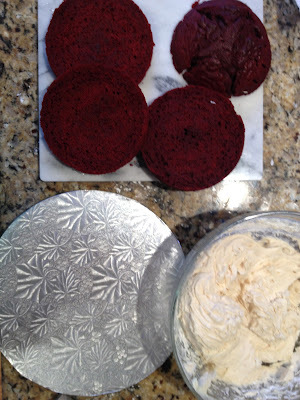 So, yesterday for our anniversary I wanted to make L. a very special Red Velvet Cake. 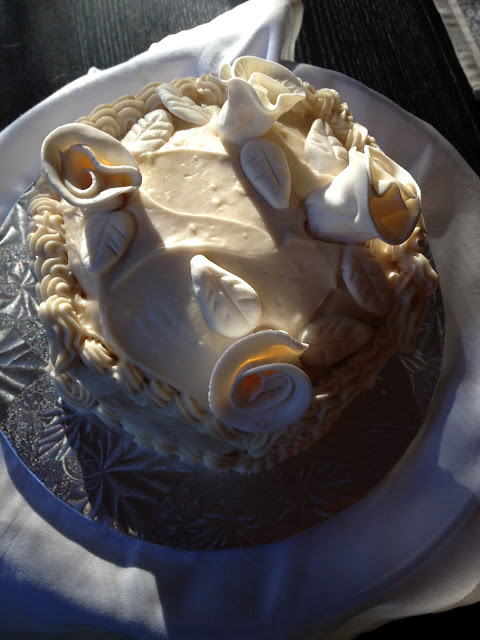 I wanted this cake to be small, multi-layered and memorable. 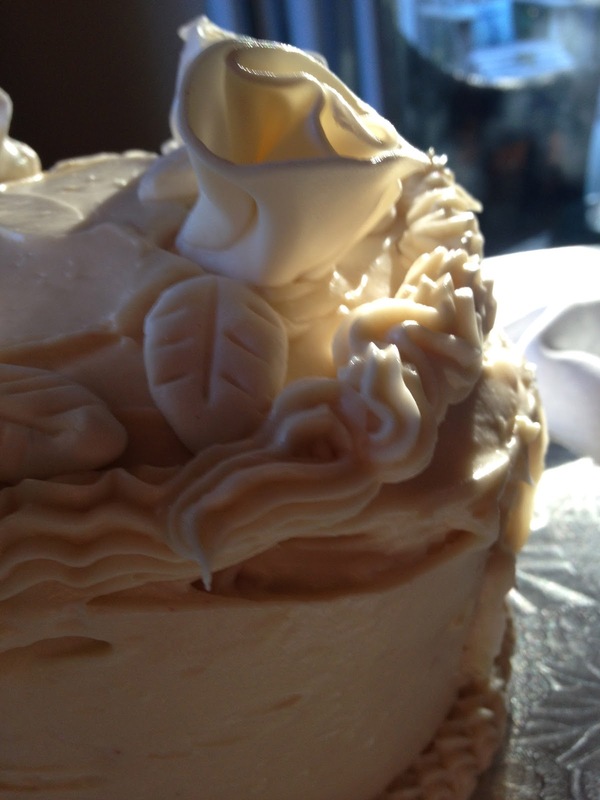 So I stopped by Dawn's Candy and Cake shop and with help from the owner, Dawn, I learned how to make a cake that literally brought tears to my husband's eyes last night. With Dawn's help, I bought two small 5" pans called Fat Daddios. I also bought a #18 frosting tip, a small fondant rolling pin and a disposable frosting bag. Next, I asked if she had a small bride and groom topper but they were all too overpowering for this cake so she taught me how to make cake roses from fondant icing in literally one minute. 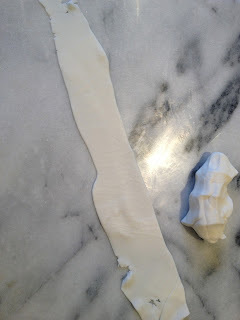 First, take gum paste and roll it out until it is VERY thin. You can then cut this piece into two strips. the next steps are shown in this video of Dawn making the roses. Once home, I made the cake batter following the Barefoot Contessa recipe (for cupcakes) and divided the batter into the two small pans. 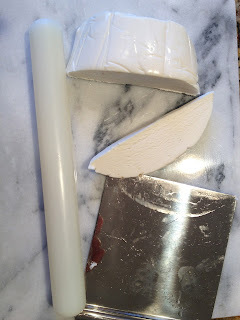 (Duncan Hines also makes a really good mix in a pinch) You will cook these pans longer than the traditional cake pans because the cakes are not as wide and they are deep. Watch them carefully. The baking time was about 28 minutes. Use a cake tester to make sure the batter is cooked. 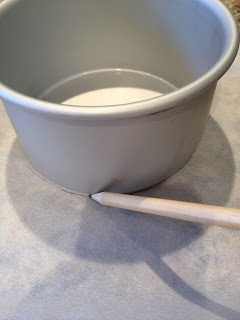 Expert Tip #2: If you're in a rush (as I was yesterday) once the cake pans have been out of the oven to cool for a few minutes (and the pans aren't hot to the touch) place the pans in the freezer to chill while you make the frosting. 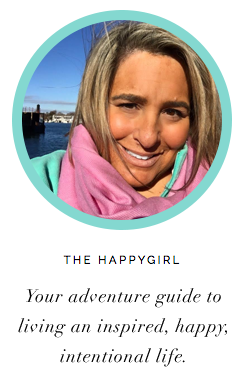 Dawn said this will lock in the flavor as well. Begin by adding frosting to the first layer then add the second layer. Frost. 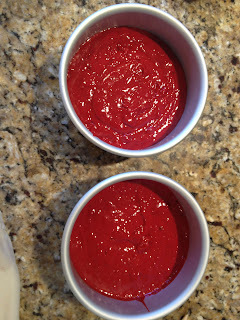 Add the third layer, frost and add the top layer. Begin frosting sides of the cake. Frost the top last. Expert tip #4: If you get cake crumbs in your frosting, it can seem impossible to fix. Just pop the cake in the fridge for a few minutes to harden just a little. It will be easier to then add another thin layer of frosting on the top of the crumb laden frosting. 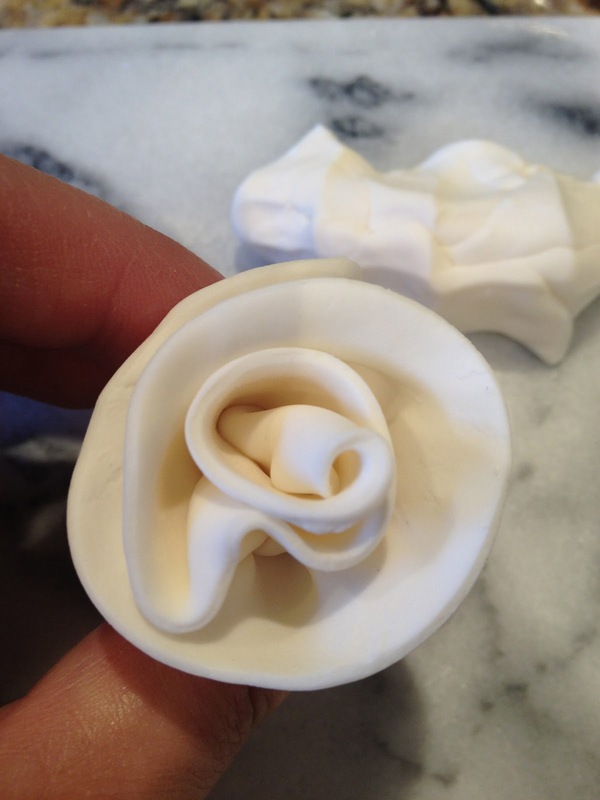 Clip the tip of the pastry bag and insert frosting tip to add decorative piping. You really can't go wrong here. 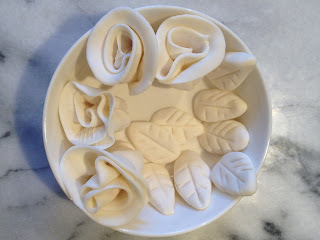 Just go slow, apply even pressure to the pastry bag and it will look wonderful. Expert tip #5: Make your cake really stand out by adding height. If you don't have a cake stand, stack five or so books and throw a white cloth napkin over it to show off your handiwork!